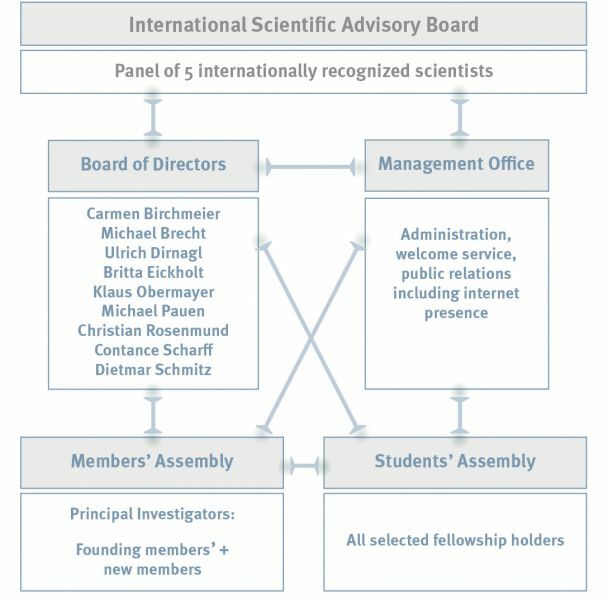 The ECN governance bodies include the Students’ Assembly, the Members’ Assembly, the Board of Directors, the Governing Director and an International Scientific Advisory Board (see Figure below). The Students’ Assembly will consist of all PhD scholarship awardees of the ECN. It elects a spokesperson that participates in meetings of the ECN Board of Directors. The Members’ Assembly consists of the PIs listed under the members’ section. The Members’ Assembly will elect the Board of Directors for a period of two years. The Members’ Assembly will participate as referees in the selection process of the PhD candidates and later as supervisors and PhD committee members. The Board of Directors will be responsible for the strategic orientation and general decisions concerning the Center. The Board is expected to oversee the Einstein Training Program. Besides the Board will supervise PhD commissions, and direct quality control measures. The Coordinator represents the Center and its interests externally. An International Scientific Advisory Board with approximately 5 members will be established, in which elected, internationally recognized scientists will meet yearly during the ECN‘s annual retreat to evaluate overall performance and advise on scientific topics and activities, allocation of funding, etc.